In this section, explore the various tools featured in SAP Business Explorer (BEx), and how they allow users to create, locate, manage and precalculate reports. Get BEx tips including how to launch queries and workbooks and categorize them into roles, favorites and folders. SAP Business Explorer (BEx) reporting tools allow users to create, locate, manage and precalculate reports. Many of the BEx tools found in SAP Business Intelligence (BI) can be installed on a client workstation using the SAP GUI and a BI add-on. 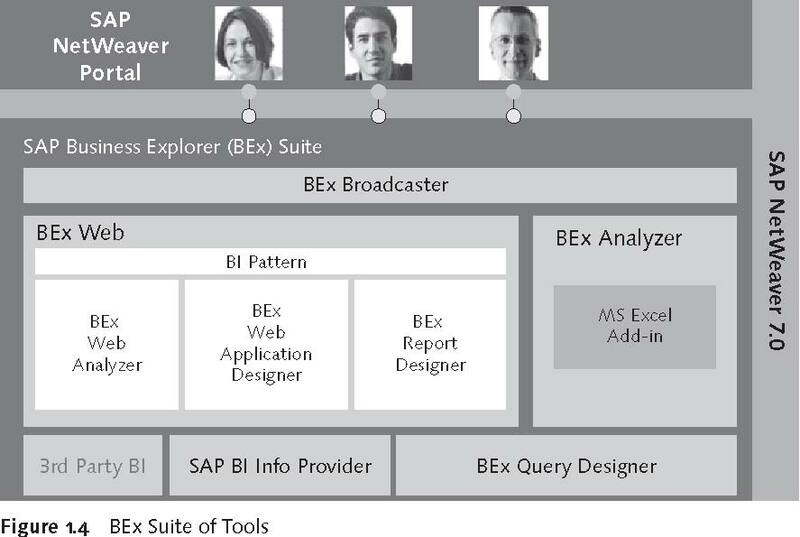 In this section, learn about using primary SAP BEx tools such as BEx Analyzer, Query Designer, Web Analyzer, WAD, Report Designer and Broadcaster, and Information Broadcasting. Discover why, in certain scenarios, the majority of end users won't have access to SAP BEx design tools such as BEx Query Designer, BEx WAD and the BEx Report Designer. Also, learn how SAP BEx Browser can be used to launch queries and workbooks and categorize them into roles, favorites and folders. A complete data-warehousing toolset that allows simple access, integration, and analysis of relational and analytical data from SAP and non-SAP data sources. The integration of analytical and planning capabilities into operational processes. A multi-environment platform that enables drill-down navigation and slice-and-dice analysis of data. The ability to distribute reports to information requesters. SAP BEx reporting tools allow users to create, locate, execute, view, format, manage, schedule, and precalculate reports. Many of the BEx tools in SAP BI are installed on a client workstation using the SAP GUI and installing the BI add-on. Most organizations define user communities that result in certain tool access being assigned to each user community. At a minimum, this definition typically involves end users and power users. Depending on the particular scenario within an organization, the vast majority of end users will not have access to the design tools and will simply execute workbooks using the BEx Analyzer or view reports on a web page. The design tools would then be assigned only to power users. Design tools are the BEx Query Designer, BEx WAD, and the BEx Report Designer. By using SAP authorization concepts an administrator can assign standard security objects, which allow for the establishment of a predefined power user role and an end user role to limit access to tools based on the responsibilities of each user community. 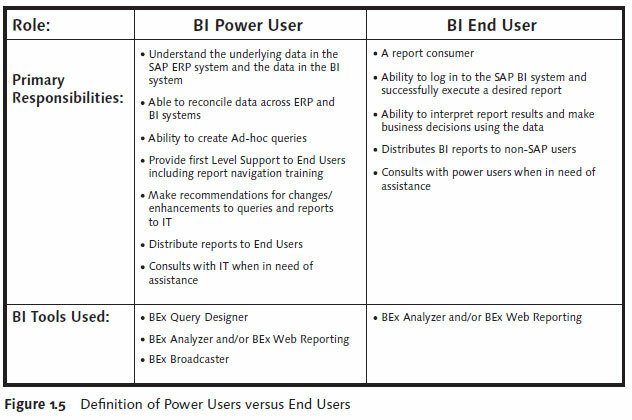 A proposal on how to split the roles and responsibilities between end users and power users can be found in Figure 1.5. In addition to the standard BEx BI tools, the BEx Browser is a tool that was part of the BW 3.x toolset. 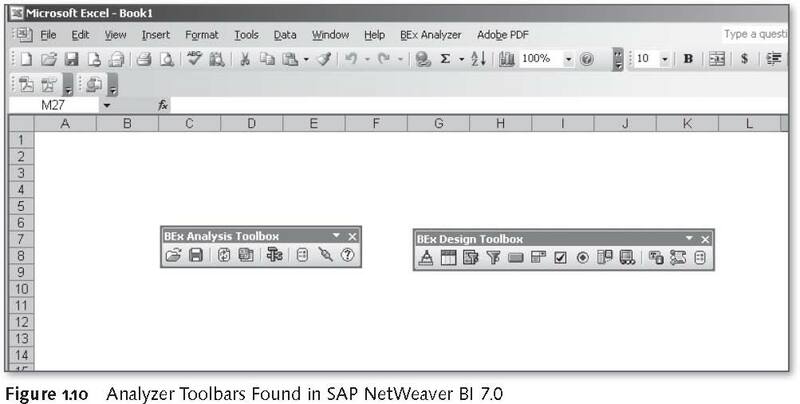 This tool is no longer available with the SAP NetWeaver 7.0 BI tools; however, it is part of the SAP BI add-on installation that, by default, will install the BW 3.x tools along with the newer BI 7.0 tools. 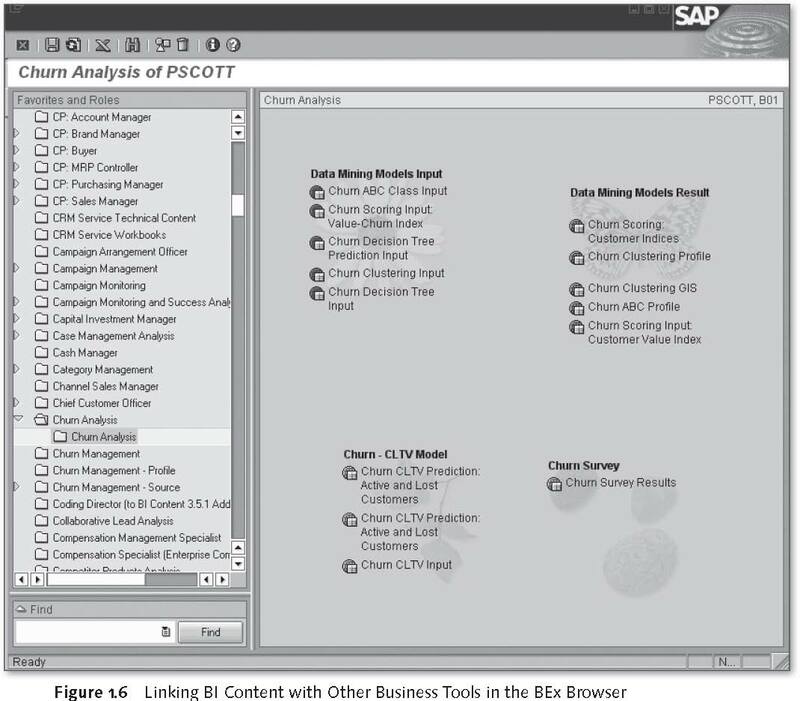 This excerpt from SAP BEx Tools by Peter Scott is reprinted here with permission from SAP Press; Copyright 2009. Download a pdf of this chapter. The BEx Browser is a graphical desktop-like tool used to launch queries and workbooks and categorize them into roles, favorites, and folders. The BEx Browser also incorporates standard shortcut functionality, which enables you to access documents, Windows applications, Internet URLs, and SAP R/3 transactions from a single interface. The BEx Browser allows users to create folders to organize their content. Figure 1.6 illustrates how BI content can be linked with other business tools in the BEx Browser. You create content within the BEx Browser on the right side of the screen. Right-clicking on a blank part of the screen displays a context menu with several options. Each folder created for a role or user favorites can be further customized by assigning a background symbol and color, which are translucent. 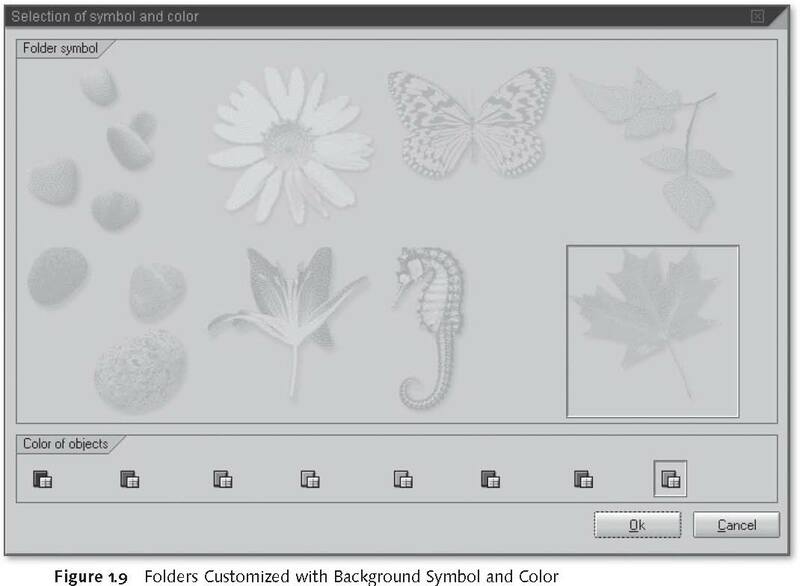 There are eight backgrounds and colors to choose from, each of which has a nature theme. To customize folder options, right-click on a folder on the right side of the BEx Browser window and select Choose symbol and color. The graphical options are displayed in Figure 1.9. The BEx Analyzer is the primary reporting environment for SAP BI. Most users find it very intuitive because it is integrated with Microsoft Excel. You can add Excel calculations, notes, charts, and graphics to a single worksheet and insert multiple reports into a workbook, thereby creating a package of reports. The BEx Analyzer combines the power of OLAP with all of Excel's functionality. You can also use Visual Basic for Applications (VBA). 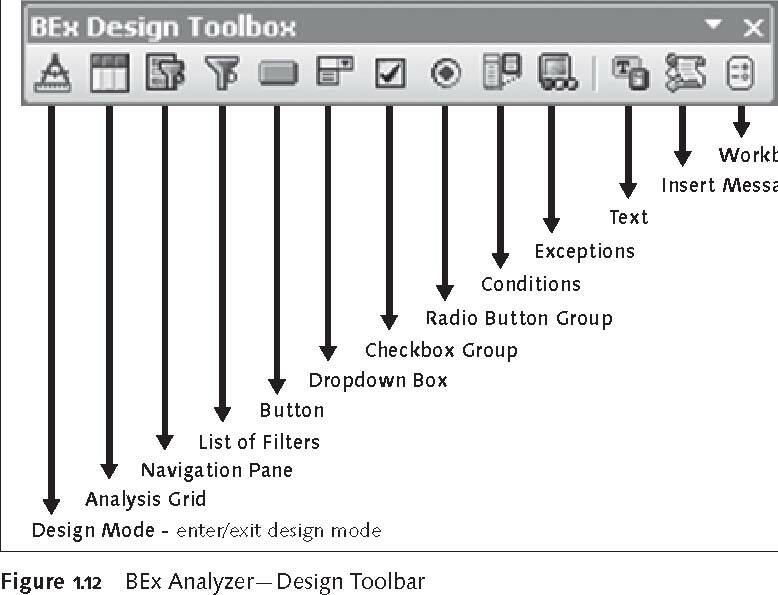 As of BI 7.0 the BEx Analyzer is also a sophisticated design tool with planning input capabilities. The BEx Analyzer's functionality is divided into two different modes, each with its own toolbar (shown in Figure 1.10) and functions. The two modes are the Analysis mode and the Design mode. The BEx Analysis toolbar is used to perform OLAP analyses on query results in a workbook environment. Working in Analysis mode, you can navigate interactively on the data by fi ltering, drilling down, and sorting. Analysis mode also provides access to the planning functionality, the BEx Query Designer, and the BEx Broadcaster. 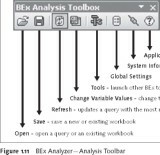 A summary of the BEx Analysis toolbar is shown in Figure 1.11. The BEx Design toolbar is used to create custom templates and interfaces for query applications within the workbook. Working in design mode allows a user to insert BI design items, such as analysis grids, dropdown boxes, radio button groups, checkboxes, and a filter blocks. Microsoft Excel functionality can also be used to insert titles, images, formulas, and text to enrich the presentation of the template. Figure 1.12 highlights the available design items. Design mode is toggled on and off using the BEx Design toolbar. By default, the BEx Analyzer provides a standard design template that is leveraged every time query results are embedded into a workbook. This default template consists of an analysis grid, filter block, information button, and a chart button that toggles the data between a graphical representation and a table view. The default template, which appears in Figure 1.13, also displays the author of the query, by user ID, and displays the status of the data—which is the date and time of the last ETL process that brought data records into the InfoProvider, which feeds the query results. 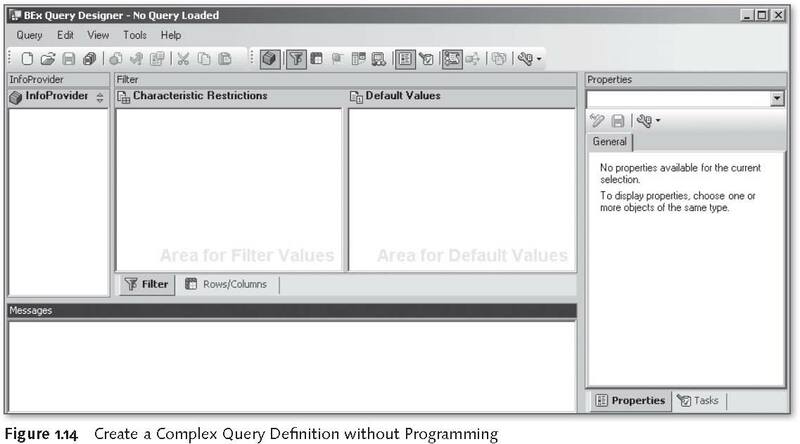 The BEx Query Designer is a standalone application that enables users to build complex query definitions without using programming. All subsequent BI reporting and analysis is based on query definitions. The BEx Query Designer is displayed in Figure 1.14. The BEx Query Designer can be launched from the BEx folder—typically found under the Start menu of a Windows-based system. It may also be accessed from the BEx Analyzer or the BEx WAD. A query defi nition that is created and saved using the Query Designer can be viewed using the BEx Analyzer or it can be viewed using the BEx Web Analyzer—also referred to as Web reporting. The BEx Web Analyzer provides a standalone Web application for data analysis that is called by entering or copying a Web address or URL into a browser. In addition, the Web Analyzer can be used to save data views generated from the navigation and analysis of a standard query layout. These query views allow users to return to a preferred navigational state in the future and view results using this view. OLAP functionality is available in both the BEx Analyzer and Web report. The BEx Analyzer requires software installation on a user's PC while the Web report has the advantage of being "zero footprint"—it requires no additional software except a standard web browser. 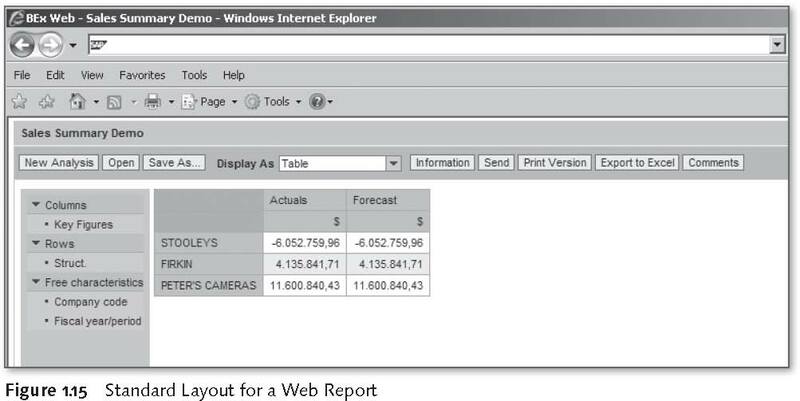 The standard Web-reporting interface is shown in Figure 1.15. The BEx Report Designer is a graphical tool for creating highly formatted static reports typically optimized for presentation or printing. It is a standalone desktop application that is launched from the BEx folder. The formatted report can be displayed on the Web or converted into a PDF document to be printed or distributed. It is typically used for common financial statements such as balance sheets and income statements. Note: To create a formatted report there must be a structure used in the Columns section of the query for which the report is sourced from. 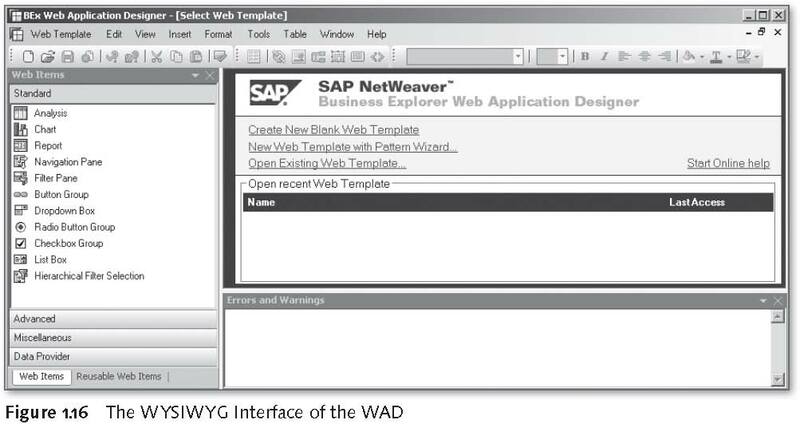 The Report Designer, shown in Figure 1.17, is a new tool that shipped with SAP NetWeaver BI 7.0 and has some basic functionality that quickly allows a designer to build a report optimized for presentation. The BEx Broadcaster is used to precalculate and distribute reports, queries, Web templates, query views, and workbooks. The precalculated results can be prepared as a document or as a Web URL that can be accessed as a link. The advantage here is that precalculating shortens the wait time for users and reduces the workload on the servers during peak hours. The distribution options allow broadcasting to email(s), portals, or precalculated reports to be sent to a printer. With NetWeaver BI 7.0 the broadcasting capabilities are typically configured using the Broadcasting Wizard. The Wizard provides an assisted set of predefined steps that support a user creating a new broadcast setting. It is possible to broadcast by email or to a Portal at a recurring time/date specified by the user or by a trigger, such as when data is updated in the InfoProvider. Certain authorizations are required to create and schedule background jobs. This access is usually only given to a limited number of users, who can then configure broadcast settings that propagate to a department or set of information consumers. The BEx Broadcaster can be launched from many of the other primary BEx publishing tools. Regardless of the launch point, the same series of steps are followed to create a new broadcast setting. 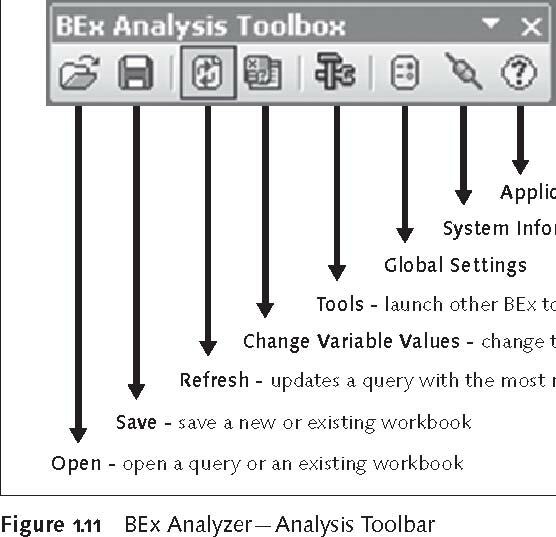 The Broadcast option only appears in the BEx Analyzer when a workbook has been opened. It is also possible to launch the BEx Broadcaster from a Web report by right-clicking on the context menu over the results area and following the Broadcast and Export menu. The overall workflow for using all of the various BEx tools is shown in Figure 1.18. The most basic reporting is accomplished by using the BEx Query Designer and the BEx Analyzer. An alternative or complementary reporting strategy to just using the BEx Analyzer is to use Web-based reporting. With Web reporting, you don't have to install any software on a user's PC, which is why this alternative is known as a zero-footprint solution. Query designers can publish formatted, graphical reports using the BEx WAD and distribute these reports via URLs or a preexisting intranet portal. High-end formatting can be achieved by leveraging the Reporting Agent, Download Scheduler, or via integration with Crystal Reports. SAP BI has evolved into a full-fledged DW. The suite of BEx tools allow users with diverse backgrounds to effectively access and analyze data in a timely fashion. 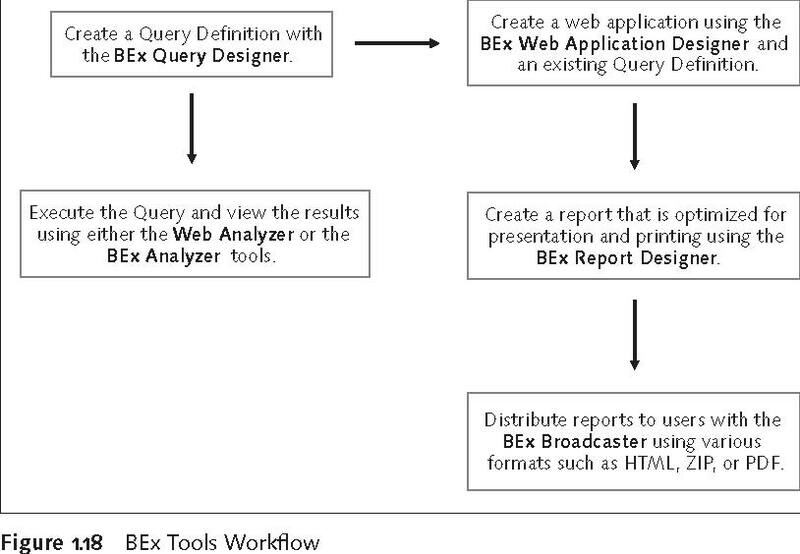 Queries are defined using the BEx Query Designer and analyzed within the BEx Analyzer or within a BEx Web Application. 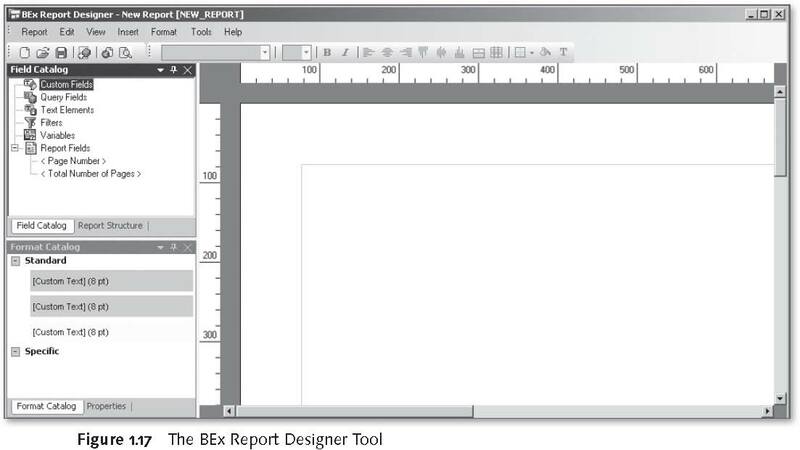 Additional formatting can be achieved with the BEx Report Designer or by leveraging the new Design toolbar found in the BEx Analyzer. Highly interactive dashboards and Web applications can be developed using the BEx WAD. Charting and graphics features in the WAD allow for quick processing of complex sets of data. The BEx Broadcaster offers the ability to distribute a variety of objects with BI content to a spectrum of users according to individual requirements. Each BEx tool has a primary function and deliverable that is then integrated with and passed along to other BEx tools for further development. This book focuses on the step-by-step processes of creating a query, viewing results, formatting reports, and coordinating the distribution of knowledge and information. The next chapter will look at the BEx Query Designer in detail. You can download a pdf of this chapter. You can also visit SAP Press to purchase a copy of SAP BEx Tools -- 2nd Edition. You'll find more downloadable excerpts from books by SAP experts in our SAP chapter download library.